NEW DELHI, February 16: VK Sasikala’s nominee Edappadi K Palaniswami was sworn in as Tamil Nadu Chief Minister by Governor Ch Vidyasagar in Chennai this evening. He is the third person to hold the post in as many months. 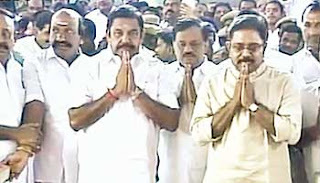 Palaniswami will head a 31-member Ministry. All members of outgoing Cabinet except Panneerselvam and Ma Foi K Pandiarajan have been retained. Dindigul Srinivasan will be number two in seniority in the new Cabinet. Sengottaiyan is ranked No 3. Sengottaiyan - School Education - He is the new minister. He is replacing MaFoi K. Pandiarajan. P. Balakrishna Reddy - Animal Husbandry. Earlier in the day, a statement from the Raj Bhavan said: "Hon’be Governor has requested the Chief Minister-designate, Thiru Edappadi K. Palaniswami to seek the vote of confidence of the Assembly within 15 days." The invitation came "in acceptance" of the letter submitted by Palaniswami on February 14. Palaniswami has been a staunch loyalist of All India Anna Dravida Munnetra Kazhagam (AIADMK) supremo Jayaram Jayalalithaa since the time she entered active politics in the 1980s. He was part of her four-member kitchen cabinet from 2011-16 along with Chief Minister O. Panneerselvam and former ministers Natham R. Viswanathan and R. Vaithilingam. Hailing from the rural Nedungulam village in Edappadi taluk, 62-year-old Palaniswami joined AIADMK in the 1980s. He threw his weight behind Jayalalithaa when the party suffered a split after the demise of founder M.G. Ramachandran in 1987. Jayalalithaa instantly rewarded Palaniswami, hailing from Kongu Vellala Gounder community — a dominant community of the western region of the State — by nominating him as the AIADMK (Jayalalithaa) candidate in the rural Edappadi constituency in the 1989 elections. He tasted success in his maiden attempt and retained the seat in the 1991 elections. Palaniswami, a farmer by occupation, who remained on the sidelines for almost a decade, was in the fray from Edappadi once again in the 2006 elections. However, he lost to the Pattali Makkal Katchi’s (PMK) V. Kavery. But he wrested the seat for the third time in 2011, defeating M. Karthe of the PMK. He was inducted into the Cabinet as State Highways and Minor Ports Minister. He soon became a close confidante of Jayalalithaa. Though Jayalalithaa reshuffled her Cabinet umpteen times, dropping even senior Ministers during her 2011-16 term, Palaniswami remained a prominent member of her team for the entire five years. In the May 2016 elections, Palaniswami was fielded again in Edappadi and he romped home with a whopping margin of 42,022 votes over his nearest PMK rival N. Annadurai in a 15-cornered contest. While Palaniswami secured 98,703 votes, Annadurai polled 56,681 votes. The DMK candidate P. A. Murugesan was pushed to the third position with a vote tally of 55,149 votes. Palaniswami not only won his seat comfortably, he also steered the AIADMK to a near clean sweep in Salem district, winning 10 of the 11 Assembly constituencies — many with decent victory margins. In recognition of this striking show, Jayalalithaa not only retained him in the new Cabinet with the same portfolio, but also rewarded him with the powerful PWD.